I really enjoy getting away to another city for a couple of days when possible, it’s amazing how much you can pack in while still taking it easy having plenty of chill time. After a weekend, though often tired I feel completely refreshed, it’s so good to see other places, see how people live, shop, eat, drink etc. As I gaze out of my window at the torrential rain I can still feel the warmth in my bones from last weekends trip to Malaga which is, in my view a simply brilliant city to spend a couple of days in. Small enough to wander around on foot easily, relaxed, warm and with plenty of options of things to have a look at and experience as you wander around which is the perfect mix for me. In fact I enjoyed it so much I’ve got a few different blog posts to write such was the variety of the experience. If at all possible I like to try and go somewhere in Southern Europe in May as it feels like a huge reward to be able to stroll about in shirt sleeves, the sun warming the bones, a cold beer sat outside somewhere watching the world go by which is in stark contrast to the last few months hunkering down in the cold and rain of Northern Europe. Malaga fits the bill perfectly for this, couple of hours flight but feels like a different world and a solid 25 degrees C.
Of course many (perhaps most?) of the planeloads landing at Malaga airport go nowhere near the city as they head off to the beaches and resorts but walk out of the doors of the airport and twenty minutes later a fast train from the station across the road will have whisked you into the city centre. Once there ditch the bags and head out to explore. 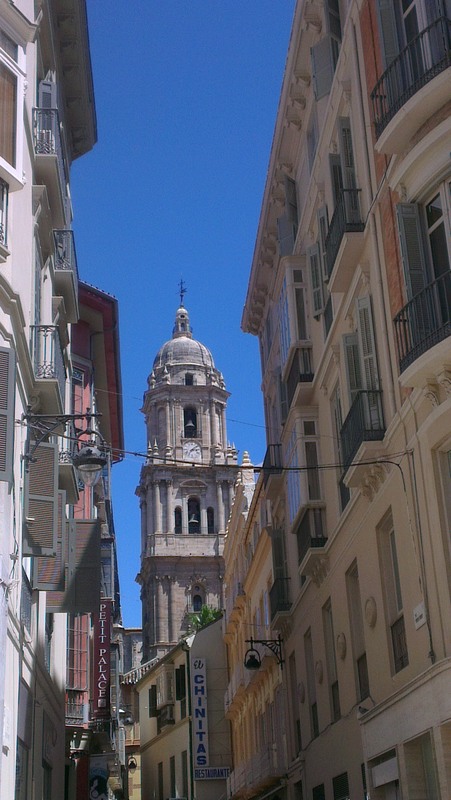 Malaga spans almost 3,000 years of history after being founded by the Phoneticians falling subsequently under the control of the Romans, Visigoths, Vandals, Moors before finally settling under Christian rule in the 1400’s. The history is reflected in the remains of the Roman theatre right in the heart of the city, the castle of Gibralfaro, numerous churches and a huge Cathedral. When you combine this history and architecture together with the cities three fantastic art galleries (modern, Picasso and traditional), a regenerated harbour area and a beach a mere ten minutes stroll from the centre you have all the ingredients for a good city. The city centre is pieced together by a maze of old streets and squares with a seemingly endless supply of eateries making it perfect for just wandering around. At night the atmosphere was really special as seemingly the whole of the city comes out for the Spanish tradition of el paseo where all ages stroll around, chat, greet friends, eat ice cream and create an atmosphere that just makes you want to smile. Pitch yourself on an outside table with some wine and people watch to your heart’s content, it’s as far removed from the average Saturday night in any British town or city as it’s possible to imagine. I can hugely recommend it and hopefully the pictures give an overall flavour of the city.